Since home prices for the Twin Cities metro have fully recovered and then some, it’s tempting (and even somewhat logical) to assume that monthly mortgage payments are also at all-time highs. That assumption would be entirely inaccurate. But it makes so much sense! 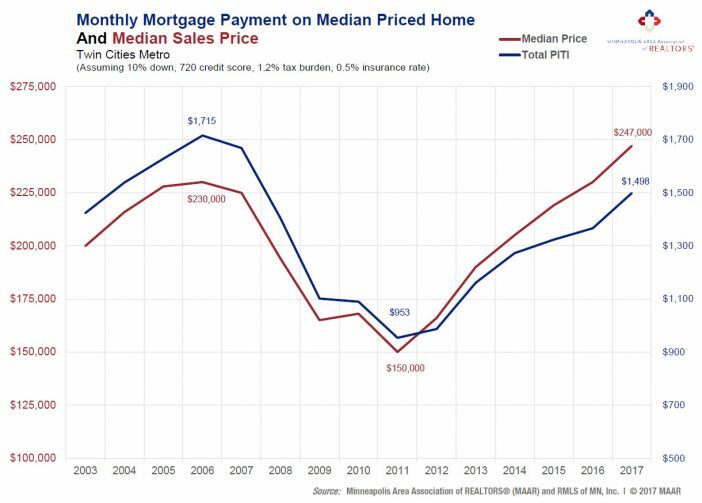 If the median home price is at an all-time high, the monthly mortgage payment on that median priced home must therefore also be at an all-time high. Nope. Still false. What this assumption fails to account for is of course mortgage or interest rates. The last time prices were this high, in 2006, the 30-year fixed mortgage rate was about 6.5 percent. In 2017, rates are averaging around 4.0 percent. That’s where this all-too-common assumption falls flat on its face. The monthly payment on the median-priced home in 2006 was $1,715, but is only $1,498 in 2017, thanks to rates being 2.5 percentage points lower (6.5 vs 4.0). The median home price, however, has now reached $247,000 compared to $230,000 in 2006. So while affordability has declined since 2012, it still remains above 2004-2007 levels. In other words, despite prices being higher today than in 2006, monthly payments on purchased homes are still below where they were during the housing bubble. Minneapolis, Minnesota (September 18, 2017) – The Twin Cities housing market continues to show signs of high demand and short supply. 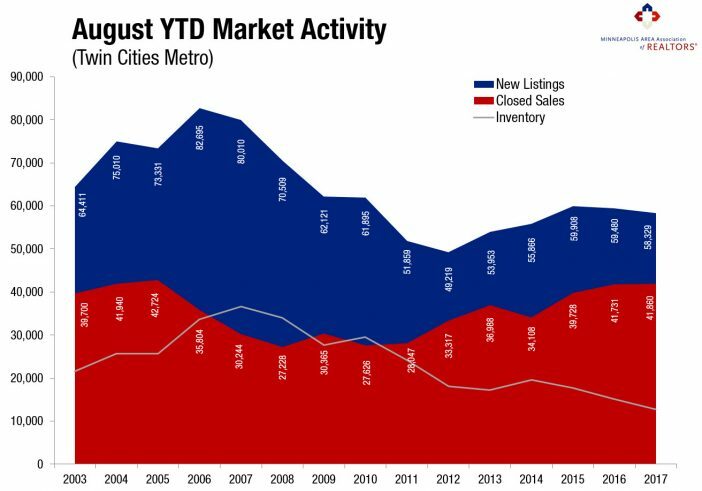 While June 2017 marked an all-time home sales record for the Twin Cities, closed sales showed a year-over-year decline for the second consecutive month. The number of sellers listing their homes increased slightly, but that wasn’t enough to counteract the inventory drop. New listings increased 0.7 percent from last year to 7,264, and closed sales dipped 1.4 percent. The number of homes for sale decreased 16.7 percent to 12,602. Factoring out foreclosures and short sales, traditional new listings rose 2.4 percent while traditional closed sales increased 0.9 percent. With many consumers competing for limited homes, prices remained firm, a trend that should continue into the fall and winter months. The median sales price rose 6.8 percent from last year to $252,000—a new monthly record for August. Home prices have now risen for the last 66 consecutive months or 5.5 years. At 48 days on average, homes went under contract 14.3 percent faster than last August. Sellers who do list are averaging 98.5 percent of their original list price, 0.6 percent higher than August 2016. The metro area has just 2.5 months of housing supply. Generally, five to six months of supply is considered a balanced market where neither buyers nor sellers have a clear advantage. The shortage is most acute for entry-level homes. Well-priced, turnkey, well-presented listings are most competitive. Market times and absorption rates are tightest for homes priced under $200,000. For example, homes between $150,000 and $190,000 had 1.4 months of supply. As you move up the price ladder, the market is less competitive and better supplied. Homes priced between $500,000 and $1,000,000 boast 6.0 months of supply, while homes over $1,000,000 have a plentiful 12.3 months of supply. The most recent national unemployment rate is 4.4 percent, though it’s 3.3 percent locally—the fourth lowest unemployment rate of any major metro area. A thriving and diverse economy has been conducive to housing recovery, as job and wage growth are key to new household formations and therefore housing demand. The Minneapolis–St. Paul region has a resilient economy with a global reach, a talented workforce, top-notch schools, exposure to the growing technology and healthcare fields, and a quality of life that’s enabled one of the highest homeownership rates in the country. The average 30-year fixed mortgage rate has declined from 4.3 percent to 3.8 percent recently, still well below its long-term average of around 8.0 percent. Although at least one more rate hike was expected this year, the Fed is now focused on unwinding its large portfolio. Additional inventory is still needed in order to offset declining affordability brought on by higher prices and interest rates. For several years, residential real estate markets across the country were relatively similar except for a few pockets of extreme price increases in the west and a few areas of slower post-recession recovery in the east. Regional market diversion is becoming more common. Natural disasters play a part, as do factors such as the proclivities and incomes of a younger buyer pool. Market trends have remained steady for the last couple of years, which has allowed residential real estate to flourish in terms of sales activity and buyer demand. Even when total sales are not measuring forward in year-over-year comparisons, it is evident that the market is responding positively to wider economic indicators. Higher prices, fewer days on market and lower months of supply are all usual indicators of healthy activity. Conversationally speaking, it has been a busy and exciting summer for residential real estate. Much has been said about low supply, higher prices and speedy sales, but the truth of the matter is that buyers are snatching up desirable homes no matter the trends. Good transactions are occurring with smart lending practices. Although more inventory would be useful, the market is finding a way to succeed. With each passing August day, fewer households with school-aged children are willing to embark upon a big move for fear of unsettling kids from the important routines that lay the groundwork for a good education. But savvy sellers and buyers know that there are good deals to be made in August and well into the school months, as household formations take on many shapes and sizes. The prevailing trends have continued to prevail through the summer, which has not really been a surprise. There have not been any jolting changes in the economy that would affect residential real estate. This includes steady news for factors such as wage growth, unemployment, new construction and mortgage rates. Every locality has its unique challenges, but housing as a whole is performing as expected.